The cost of not acting on climate change could be increasing 500 billion US dollars annually starting from 10.5 trillion in 2010. 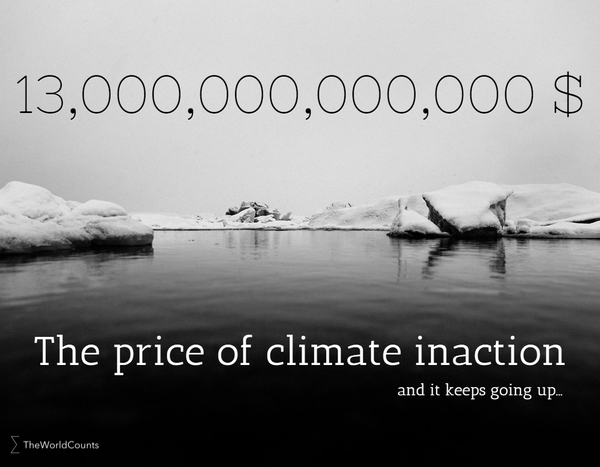 Other estimates are even higher - up to an astronomical 74 trillion US dollars. That is more than global economic output in a year. Climate change can be curbed, but it requires massive investments in green technologies and low-carbon renewable energy sources. The International Energy Agency estimates that every year's delay beyond 2010 will add another 500 billion US dollars to the extra investment of 10,500 billion US dollars needed from 2010-2030 to curb carbon emissions, for example to improve energy efficiency and boost low-carbon renewable energy. This is, of course, a very rough estimate. Other estimates are even higher - up to 74 trillion US dollars (Global Development and Environment Institute, Tufts University). Interested in more facts like the climate change economic impact? Then plug in and subscribe to our newsletter.